Short walk north of Christchurch. 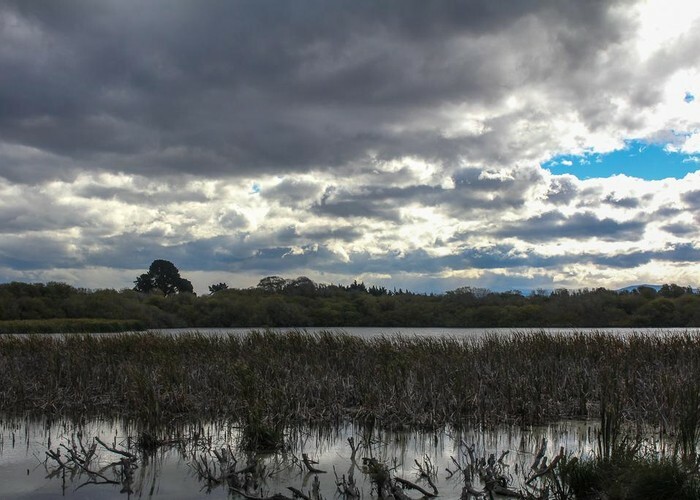 Tutaepatu Lagoon • By Matthew. Licence: cc by-nc-nd. This trail leads along the western edge of Tūhaitara Coastal Park. The park is being restored and revegetated, but is currently dominated by plantation pine. The trail is open to cyclists and walkers, and is very smooth and flat, if rather dull. The trail could be combined with the Pegasus Walkway to form a loop. From Woodend Beach, the trail begins just to the left of the holiday park, and sidles past a pine block, coming to the Tutaepatu Lagoon after 15 minutes. Near here, a link track leads through to the Pegasus Walkway. Soon the track follows a short roadside section. Eventually, the track passes a new water treatment plant and horse float park before emerging at Waikuku Beach. Turn right and follow the trail at the end of the cul-de-sac to connect up with the Pegasus Walkway. Added 1 April 2013 by MatthewMatthew. No revisions.